For this Blogger’s Quilt Festival, I’m entering the teeniest, tiniest quilt I ever made. I made it for the itty bitty bed in my daughter’s dollhouse. Check out this post for more info on the process. There is something satisfying about working on a miniature quilt like this one. How tiny can the blocks get?!? I may just try and find out one of these days. Do You Think She Likes It?!? Oh my! That is SO tiny and SO cute! Adorable. What girl wouldn't love that? Great palette. I can't fathom such small pieces, but boy do I admire your work. 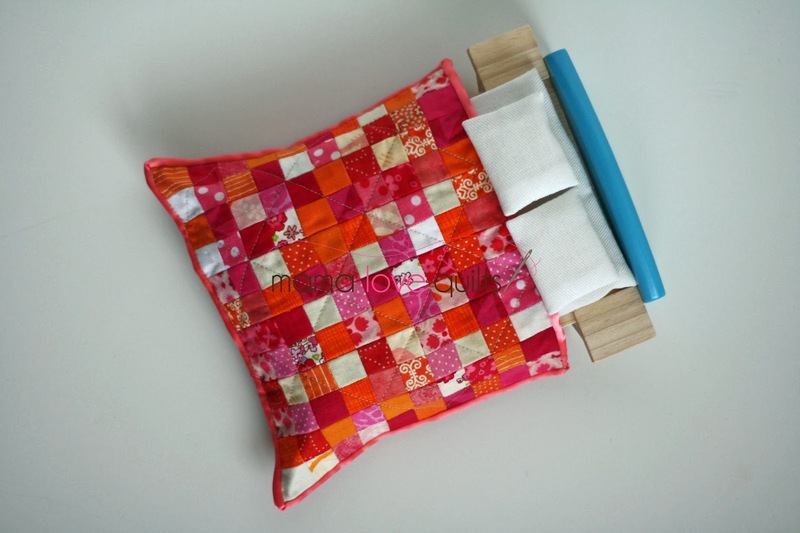 Love this doll quilt! YAY for the teeny tiny quilt! I loved this one then, I still love it now! It fills me with such joy over the teeny tininess of it… 🙂 Nice to see it again. This is adorable. I am so happy my daughter is not looking over my shoulder right now. You did a wonderful job. wowzers – the tininess just boggles my brain! So adorable!!! Gnomes and elves everywhere are coveting this beauty! I have absolutely no idea how you do this!!! It is beautiful!!! And teeny tiny!!! Fantastic!! It is so cute, Nicole! I remember looking at it on your first post and wondering at the patience you have for making something so tiny! So cute! 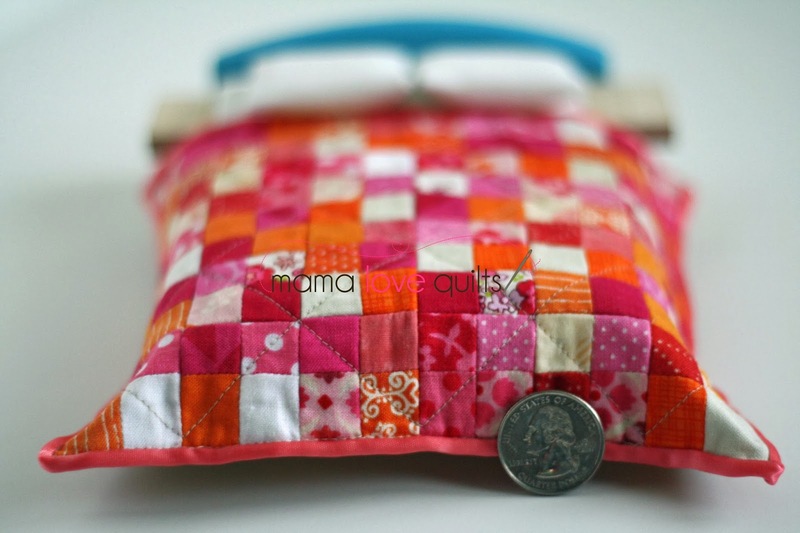 I love using the tiniest scraps in small quilts. And your colours are amazing. This is so sweet and the photos are brilliant! A.D.O.R.A.B.L.E. My eyes are squiggly just imaging sewing that together. I just voted for her in the teeny tiny quilt category! Incredibly neat for such a tiny quilt!